Personalized Two-Sided Arch Lawn Marker - - 2 side address sign with lawn stakes. Made in USA. The same personalization appears on both sides of the plaque. Holds one or two lines of text. The one-line version holds up to five 3" characters OR up to seventeen 1.25" characters (including spaces). As shown in the images, the first letter of each word is larger than the other letters. Color combinations: AB antique brass; AC antique copper; BG black with gold characters; BS black with silver characters; BW black with white characters; GG green with gold characters; OB oil rubbed bronze; OG bronze with gold characters; PS pewter with silver characters; RG red with gold characters; and WG white with gold characters. 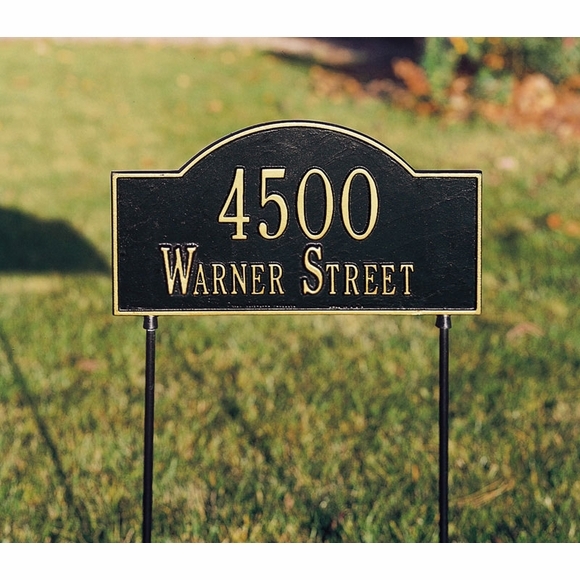 It's easy to add curb appeal and dress up your front yard with a personalized address marker. Great quality! Far nicer than I expected. Looks great in front yard.